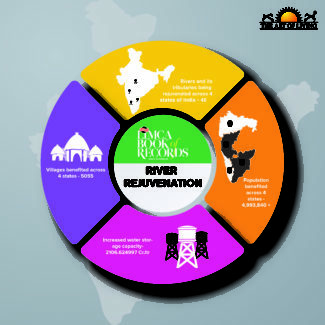 Bengaluru, 11th February 2019: Gurudev Sri Sri Ravi Shankar-founded The Art of Living has been included in the Limca Book of Records 2019-India At Her Best for the ‘Most extensive river rejuvenation by an NGO’ for the organization’s effort to resolve the country’s severe water problem by reviving 40 rivers and its tributaries in four Indian states and making more water available by raising the water table especially in drought prone regions, benefiting 49.9 lakh people in over 5000 villages. The project works on the philosophical principle that individual transformation alone can bring social transformation. 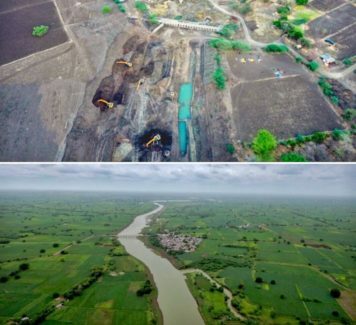 As a nodal agency, The Art of Living collaborates with local communities, corporations and government to get the massive task of river rejuvenation underway. First, geological scientists and environmental experts carry out extensive scientific assessment of the area using geohydrological surveys and remote sensing technologies. Then, with the help of community participation programs, contribution of Art of Living volunteers and over 5000 locals, ground water recharge structures are constructed and desilting of pollutants carried out. For the long term, steps have been taken to encourage afforestation and shifting to cropping patterns for climate resilient farming practices.